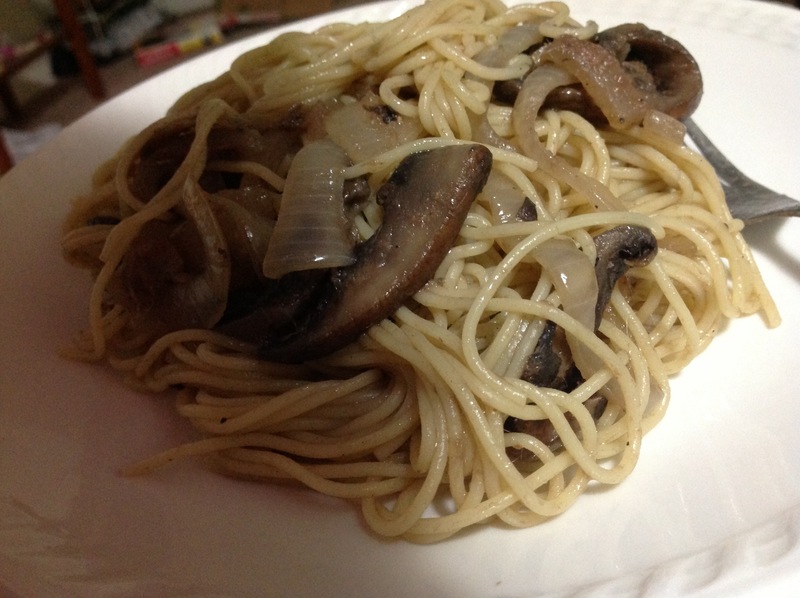 I made this recipe randomly when my refrigerator left me only anchovies in oil and one sweet onion, but thank for my ignorant time, this recipe is good enough to make me decide to cook this spaghetti again. The anchovy flavor is quite strong, making the spaghetti has the unique flavor. I do think for someone that is fed up with the red sauce spaghetti, give this dish a try and you will see that any food can be boring except the spaghetti. You can create any flavored spaghetti as long as our earth still has something that is edible. – add in the mushroom. Stir for 3 minutes until the mushroom is soft and the water from mushroom comes out. – add freshly ground pepper. Add more salt if needed. I know Tet holiday in Vietnam (Lunar New Year for several Asian countries) has ended today. But it’s not late to introduce this traditional Vietnamese braised fish coz it’s a good serve for any dinner, or any lunch, or any brunch, or …even breakfast. Braised fish is very simple, except you have to give the fish a long time to be fully cooked. Do not use deep sea fish coz it would loose its smell if braised. Fish which resides in sweet water like river works best for braise. Any fish dish requires you to remove the seafood’s odor, no matter what the fish is so pricey that the customers sometimes even don’t wanna loose the fresh smell of the fish. Well, don’t ever think that sushi is just fresh nice cuts of fishes. Sushi makers have to use their secret method to cut off the odor of that chosen fish sushi, ironically, the chefs never share their mystery. I use dried galangal and green tea to get rid of all the smell of the fish. Fish braised with some fatty is a good choice. The fish itself has high protein so that it would be dry when braised. Believe me, the skin on the pork belly would be soft and tangy after the cooking time. 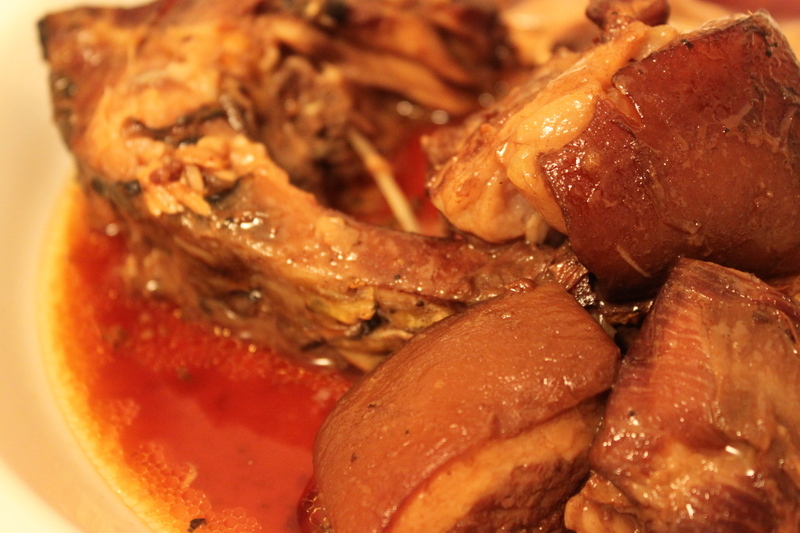 And believe me again, you would like to eat the pork belly even more than the braised fish. – Marinade fish and pork belly with the seasoning mix, except the galangal, green tea powder and sugar, for at least 2 hours. Note: use sugar when the cooking is finally done, otherwise sugar makes the meat tough during the cooking process. – Place the dried galangal onto the bottom of a large stock pot. If you have a clay pot, it works best but if you don’t, use any stainless steel stock pot that can fit both the fish and pork belly. Arrange the carp with the pork belly somehow that all the fish and meat are in one layer. – Pour in enough water that the carp and meat all are submerged. Add green tea powder. – Bring the fish mixture to a boil then reduce the heat to low-medium heat so as to the heat just keep the water boil all the cooking time. – Cook for 2 hours or until you skew the pork belly easily. That is done for the braising process. – Cool the fish completely in order not to break the fish when you take it out. – Serve: Use a big flat spoon to take out the fish, pork belly and enough sauce as you like. 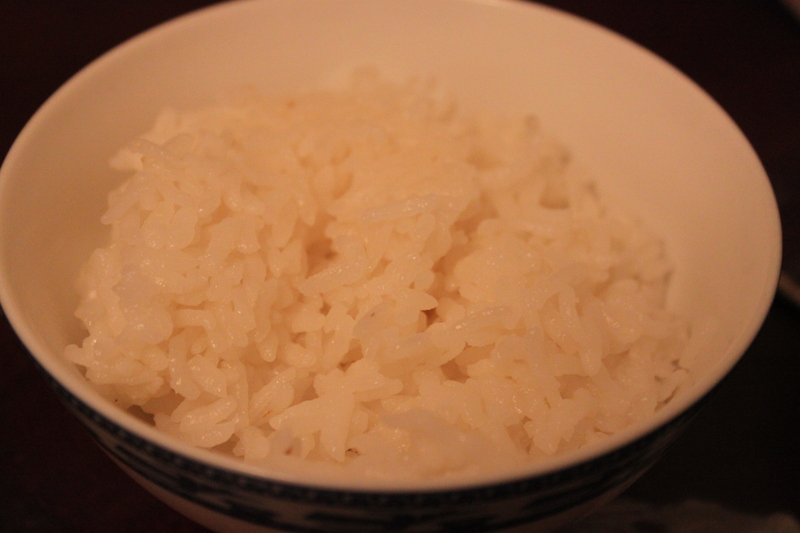 Microwave 1 minute covered for warming the fish and meat and serve with cooked rice. Note: The braised fish can be refrigerated for 1 month without losing its flavor. Just reheat each time you crave for the braised fish. I like any pasta cooked with dry wine. Seafood works well in combination with wine, preferably for me dry red wine with its pungency can delete any trace of seafood’s odor. Many people get confused when they buy anise from the supermarket. Actually, we should call it the fennel bulb rather than anise to clarify this misunderstanding. Anise star has a much much much stronger flavor than Fennel. We can meet Anise star easily in most of Indian curry or Pho of Vietnamese. 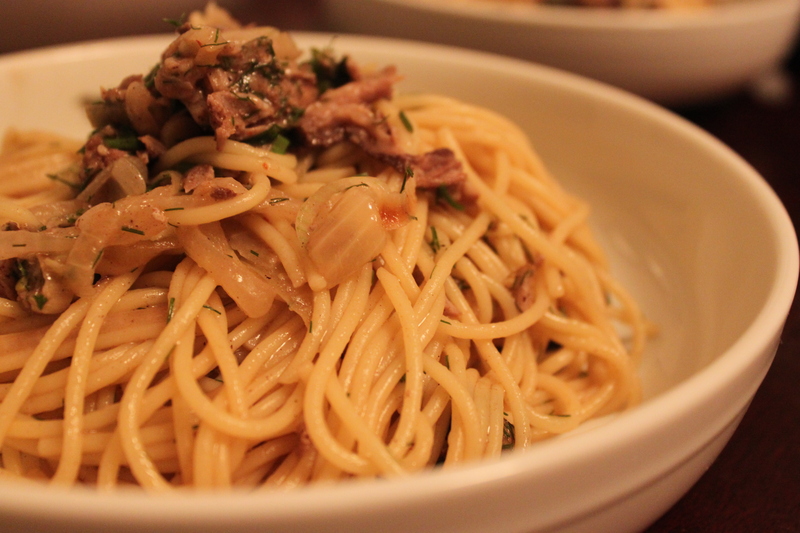 Fennel somewhat has a similar flavor like anise star, however it’s really a good idea to combine fennel with spaghetti. 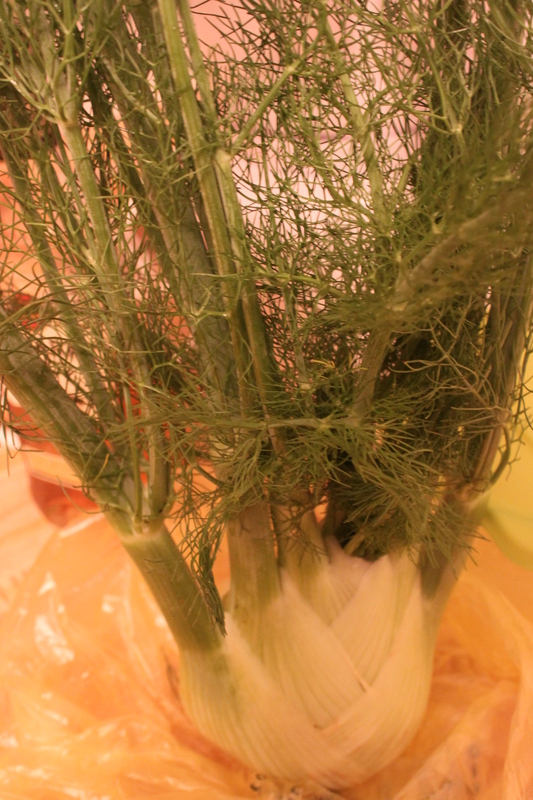 Don’t throw away your fennel leaves, which are the green part of the fennel. It’s a really really a unique condiment. – In a large pot, boil 5 quart water to a boil with 1 tbsp salt. Cook the bluefish for 5 minutes or until it’s just cooked. Don’t over cook it, otherwise the fish would be dry and lose its flavor. – Retain the fish water. Add the pasta and cook until it’s just al dente, about 5-6 minutes. Drain it. Reserve 3/4 cup pasta cooking water. – Heat a shallow large pan with olive oil. Saute the onion at medium heat until it’s caramelized then reduce the heat, slowly add the dry red wine. When the dry is boiled, add butter. – Add the pasta along with the cheeses. Stir evenly with the shredded fish, chopped anise and green onion. Slowly add the pasta water up to 3/4 cup to thin the sauce. – Add more salt to your taste. Sprinkle pepper and serve. Salmon has lots of fat on its skin. 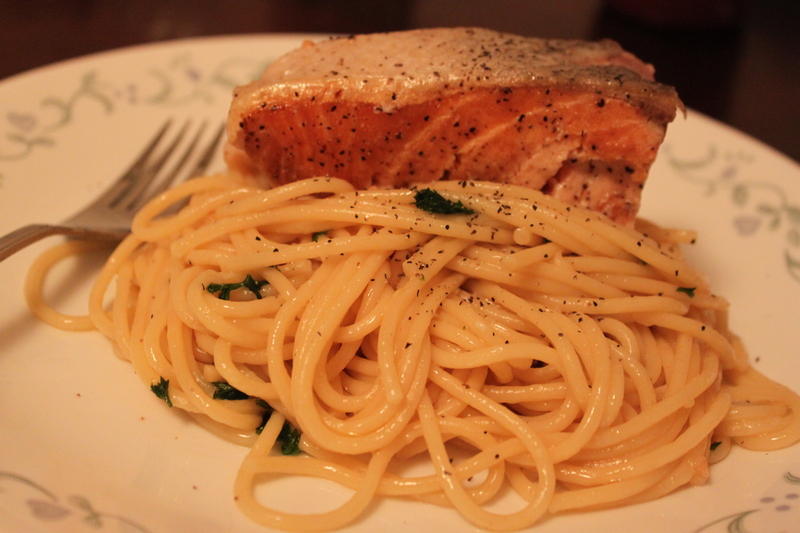 And seared salmon makes it best to combine with spaghetti. Alfredo itself is so fatty with mainly based on butter. Lemon can balance the overwhelming buttery flavor of Alfredo so well that I even don’t recognize I’m eating Alfredo. Among cheeses serving with spaghetti, Pecorino Romano has unique pungent flavor. Pecorino means any cheese product that is made with goat milk. I like inhaling the airy flavor every time grating this cheese. – Boil the water with 2 tbsp salt and cook the spaghetti until it’s just al dente (around 11 minutes). Drain the pasta thoroughly and reserve 1/2 cup pasta cooking water. – Chop the parsley finely. Wash the salmon and break it into 4 portions. – Toss the pasta in the cheese mixture. Add more pasta water gradually to thin the sauce if you want a thin sauce. Add salt to your taste. – Serve with salmon, freshly ground black pepper and lots of lemon drops.